The first derivative test is a tool for determining whether a critical point of a function is a maximum or minimum or neither. This test can be really confusing if you don't understand the intuitive idea behind it. In this page we'll delve into the intuition, and we'll see how easy it is to apply it once we have that understanding. On the page about critical points we saw that extreme points, that is, points of maximum or minimum, must be critical points. We learned how to locate the critical points. 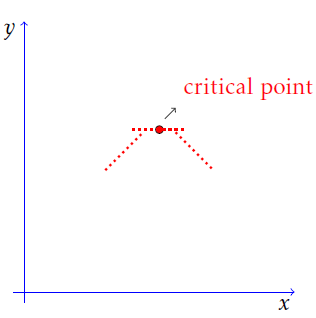 The next step is to determine which of those critical points are extreme points, and which aren't. That is when we apply the first derivative test. This test consists on analyzing the derivative of the function to the left and the right of the critical point. Let's see how it works. Let’s suppose x0 is a critical point of the function f(x). Let’s also say that the derivative to the left of the critical point is positive, and to the right of it the derivative is negative. Using this information given, we can graph the critical point and the tangent lines to the function near the critical point. At the critical point the tangent line is horizontal, because the derivative is zero. To the left of the critical point the tangent lines have positive slope, and to the right of it they have negative slope. This is shown in the next picture. We saw on the page on linear approximations that the tangent line is a good approximation to the graph of the function near the point of tangency. So, we can consider the shape the figure above as an approximation to the actual graph of the function. What does the picture tell us? That the critical point probably is a point of maximum. In fact, it tells us that it is a point of maximum, because the tangent lines say precisely how the function changes. And the rule we just deduced is the first part of the first derivative test. We've shown that if the derivative to the left of a critical point is positive, and to the right it is negative, then it is a point of maximum. Another way to put this is: if there is a change from positive to negative in the sign of the derivative, then the critical point is a maximum. In this case, we have a minimum, as the figure suggests. These rules are really easy to remember. You just need to think of the slopes of the tangent lines, and consider the different possible signs they can have. In this case we can see that the point is neither a maximum nor a minimum, because the function keeps growing as x increases. The same is true if the derivative is negative to both sides, the point is not at extreme. And that's all there is to this test. This is a really intuitive idea, remember that you just need to think about the slopes of the tangent lines, and the signs that they can have. Now we are ready to learn how this works in practice. 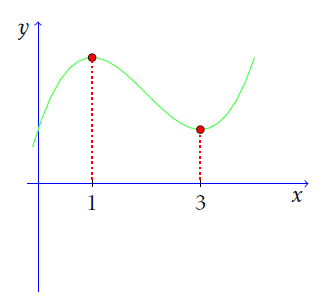 The derivative is positive to the right of the critical point. The derivative changes sign from negative to positive. This means that x=0 is a point of minimum. Now we locate the critical points, calculating the derivative and solving the equation f'(x)=0. 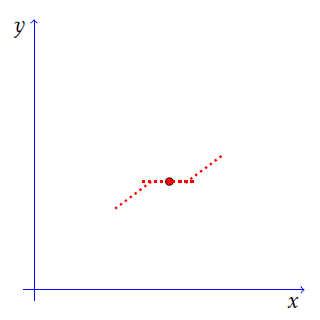 This function has a single critical point at x=0. Now look at the expression of the derivative. 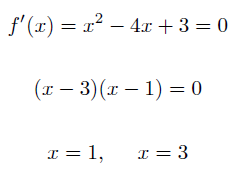 The derivative is positive for any non-zero value of x. That is because the square of a non-zero number is always positive. So, the derivative cannot change sign from negative to positive. We conclude that x=0 is not an extreme. In the previous examples it was easy to determine the sign of the derivative because we only had one critical point, equal to x = 0. Now, for most functions this is not the case. In general, we get a set of critical points. What do we do in these cases? We only need to check the sign of the derivative at one point to the left and one point to the right of each critical point. Between two critical points the sign of the derivative will be constant (positive or negative). 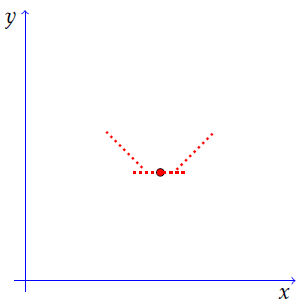 The sign of f'(x) cannot change sign between two critical points. Geometrically, if f'(x) changes sign, it means that its graph crosses the x axis. But crossing the x axis means that f'(x) becomes zero, and there we would have another critical point. But we have only three critical points! So it can't change sign between two critical points. We can divide the graph above into four subintervals. One is the interval made up of numbers x<a in the x axis. The second is from a to the red critical point. The third is from the red to b, and the fourth is for x>b. The sign of the derivative is constant at each of these intervals, because of what we just said. So, to determine the sign of the derivative in each of those intervals, we just have to evaluate the derivative at a single point. The sign at all other points on the interval will be the same as the sign on that point. That's enough chatter. If that confused you, you'll get the feel for it after seeing and solving some examples. Let's see how this is done. Those two are the critical points. These two points divide the x axis into three segments. One is made up of numbers x<1, the other is the interval (1,3), and the other is the interval made up of numbers x>1. The sign at each of these intervals is constant, either positive or negative. To determine the sign of the derivative of each interval, we just need to evaluate f'(x) with x being any number on it. For the first interval, we need to take an x<1. We can choose x=0. That seems like a wise choice, because it might simplify the calculations. It is negative. This means that at the first critical point, x=1, the derivative changed from being positive to being negative. This means that x=1 is a point of maximum. It is positive. 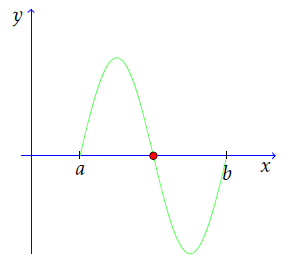 This shows that at x=3, the derivative changes from negative to positive. We conclude that x=3 is a point of minimum. The graph of the polynomial function f(x) is shown below. We have two critical points, so we need to analyze the sign of the derivative on three intervals. First we need a number x<-√2. We can take x=-3/2=-1.5. Remember that the square root of two is approximately 1.4. The derivative is positive. Now we need a number between -√2 and √2. We can take x=0. That's negative. At x=-√2 the derivative changed from positive to negative. This means that x=-√2 is a maximum. Now, let's take a number x>√2. We can take x=2. We only need to calculate the numerator of f'(2), because the denominator is always positive. It is positive. As f'(0)<0, it means that the derivative changed from negative to positive at x=√2. So, that point is a minimum. I think that those examples are enough to give you an idea of how to apply the first derivative test. You need to solve some problems on your own to master this topic. If you have a doubt or problem you want to discuss, you can leave a comment below.